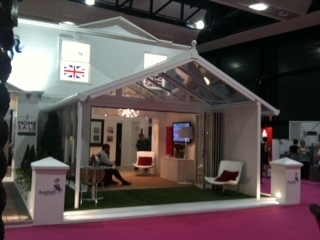 It’s exciting times at Glow, Bluewater as the Great British Home Show has opened its doors. The build has been on going over the last couple of months, but the time has finally arrived and the Anglian Home Improvements stand is looking fabulous. 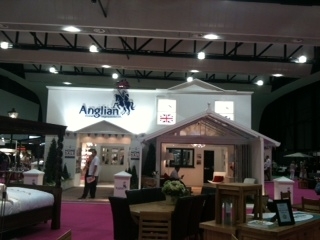 The Anglian stand is one of the biggest on display at the show, displaying a wide range of top quality products. As well as our extensive range of double glazed windows, there is a conservatory, a stand-alone-verandah a conservatory verandah as well as front doors, bi-fold doors and porches. The stand, which takes you on a methodical journey through conservatories, past lovely gardens and out through our stunning bi-fold doors, is holding a competition where you can win £1000 cash!! 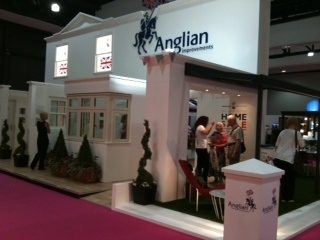 All you have to do is find the hidden portraits on the Anglian stand…easy peasy. Ann Broad and David Domoney have done a great job with the garden design and interior furnishings. 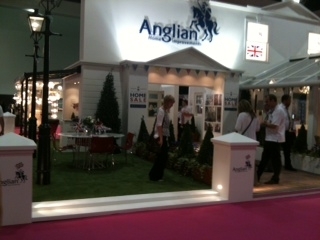 David has incorporated twirling topiary trees around the whole stand, along with evergreen artificial grass, which is in numerous different areas of the stand including underneath a conservatory verandah, which I have to say looks lovely with an effortless transition from conservatory to garden. Ann has stuck to a minimalist themed living space, using royal red and white furniture in line with the jubilee and union jack colours. 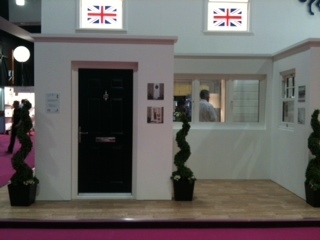 The large white stand is kitted out with Union Jack decorations, celebrating the Queens Diamond Jubilee and also celebrating our Great British Home Sale, offering 50 off windows and doors. 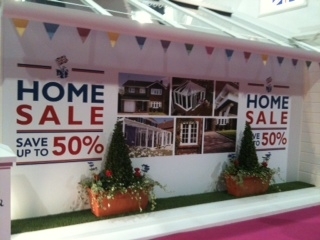 So not only can you win £1000 in cash, you can save 50 off your next window installation. Our friendly team of staff will happily discuss the options with you. Former Big Brother contestant and DIY expert, Craig Phillips opened the show with architect Oliver Heath and Anglian’s Trevor Bird, cutting the ribbon at 10am surrounded by street entertainers and a brass band. The fun doesn’t end there as more than 150 children can go wild at the indoor fair as part of Britain’s biggest indoor Jubilee Street Party. To top off the fun and to make this a record breaking show, Richard Tart and Barry Mason will attempt to break the wallpapering speed record by hanging 3 drops in under 1 minute 26 seconds. It is going to be an eventful, exciting show with merry-go-rounds, musicians, street entertainers, fairground shows along with all the usual goody shops selling candy floss, sweets, ice cream and popcorn. As part of the Great British Food celebration there will be a barbecue too, so lunch is sorted! This is definitely going to be a proud week for Britian as we come together as a country to celebrate this momentous occasion and have a fantastic time at the first ever Great British Home Show.